This new initiative by the YMCA of Greater Fort Wayne is expanding on our programming for youth and teens to provide safe places and great role models helping young people find direction or get back on track. The services we provide at the Youth Services Bureau (YSB) helps to keep youth out of the juvenile justice system and keep them attending school. YSB also runs a runaway prevention program called National Safe Place. Services are expanding with the addition of a Youth Advocate to give additional mentoring and coaching to young people. In collaboration with Fort Wayne United, the Renaissance Pointe YMCA is hosting a Late Night Basketball program to help young people with a positive place and connections to education resources, law enforcement, and employment. They come in for basketball but get a whole lot more - caring adults there to listen and support. YMCA of Greater Fort Wayne has been steadily growing our services to teens. 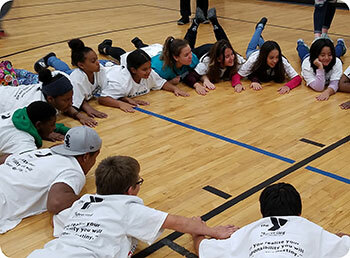 The YMCA of Greater Fort Wayne has been steadily growing our services to teens. These include the free 7th Grade Membership initiative, Teen Leaders Clubs, Middle School After-school Programs, cooking classes, music programs, and more. Teens are volunteering in our community, learning life and leadership skills, building up their friendship with one another, and growing in character - caring, honesty, respect, and responsibility. Whether its games in the gym, climbing the rock-wall, playing in the pool, or service-projects, our teens are making the most of the Y.